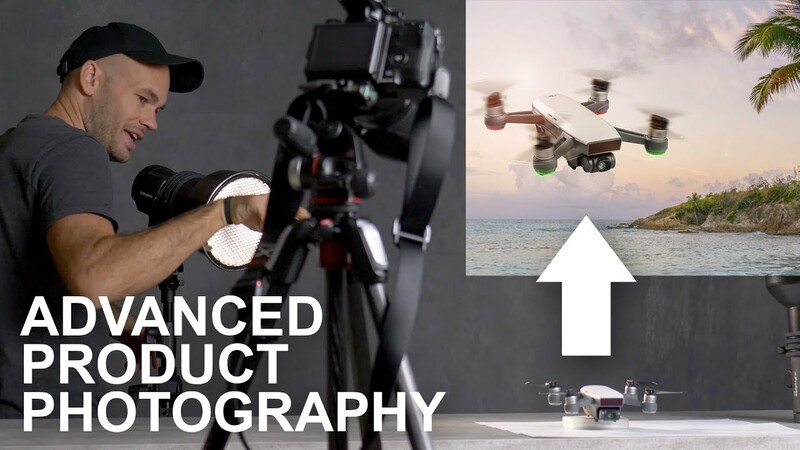 In the video above, I photograph a DJI Spark in the studio and then composite it onto a separate background. Due to the propellors, this ended up being the most complex product shot I’ve ever shot, but I tried to make the video easy to watch. There’s no way that I can explain in text what we cover in the video, so you’ll simply have to watch, it but I do want to quickly thank the sponsors that made this video possible. I was first introduced to the GFX 50S by Elia Locardi when we filmed “Photographing The World 4.” This camera is one of the first “affordable” medium format digital cameras on the market, and photographers have been loving it. Not only do you get the gigantic 51.4MP CMOS sensor, but you also get the incredible build quality of Fujifilm. Unlike other medium format cameras that can cost more than four times the price, the GFX 50S is actually weather sealed. I’ve been on so many shoots where a “high-end” medium format camera has failed for one reason or another. With this camera, you’re getting medium format quality and standard DSLR reliability. If you’re going to shoot product photography, the 120mm f/4 is the lens you need. It’s half the price of its competitors but is still built like a tank and shoots razor-sharp images. When you’re not shooting products, this lens also makes a killer portrait lens. On top of the tripod, we used the XPRO 3-way head. This head has retractable arms (that we didn’t show in the video) that make it easy to travel with, but when you’re ready to shoot, they extend to grip more easily. It also has friction settings that allow for smooth and precise movement. Although we don’t own this tripod head, we used exclusively Manfrotto heads for both still and video shooting so that we can permanently leave 200PL quick release plates on all of our cameras. If you make videos, you know how important music can be. Cheesy music will absolutely ruin a well-shot video. Royalty music is either cheap, or high quality, but Music Bed has changed the game. Now, with a monthly subscription, you have access to Music Bed’s entire catalog of songs. Depending on how you use the music, your monthly fee will be different. If you’re a wedding photographer, use the code “FSTOPPERS” at checkout to get one month free. I’ve been using Exposure for over a decade now. It’s by far the best software I have ever used to “finish” an image, but it’s much more than that. Exposure X4 is now standalone software, and many photographers are using it as their raw processor. Depending on the type of editing you do, you may not ever need to open Lightroom or Photoshop again.